Minecraft and Doctor Who seems like a pretty inspired combination, but I guess that, from a non-linear, non-subjective viewpoint, it's more like a big ball of blocky-wocky... buildy-wuildy... stuff. 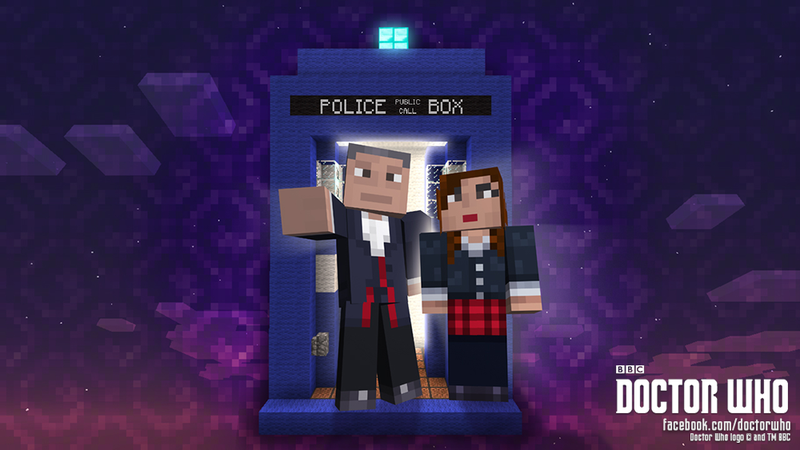 But yes, next month, the Xbox 360 version of one of the most popular video games on the planet will see the first in a series of skin and texture packs based on Doctor Who. Priced at £2 or $3, the first pack will include skins for 6 Doctors and 6 of their respective companions - including Peter Capaldi and Jenna Coleman as the Twelfth Doctor and Clara - as well as skins to recreate some iconic Doctor Who villains, including Zygons, Ice Warriors and of course, the Daleks. The BBC intends for the deal to run concurrent alongside the recently premièred Series 8, with packs of new skins coming out 'regularly' after the episodes run. There is, unfortunately, no mention of a release for the packs on any other version of the game. This is a first for Doctor Who, which has tended to have its own games rather than appear as a tie-in for something else, but not a first for the BBC - they've previously worked with Microsoft and Turn 10 studios to create Top Gear themed content for the Forza Motorsport series.